When in the course of human events people lose their jobs and their ways to pay for bags of random stuff and close-out smoke detectors, it behooves all good men to approach shopping site Woot.com with trepidation and distrust. The result? 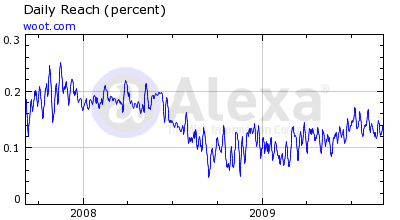 A steady decline in traffic from the post-holiday period of 2009 until about May 2009. Now, however, that is changing. If I can draw your attention to this graph, you’ll notice that yes, traffic is going up. Everything is going to be OK. The general trend at Woot has been heading down since 2008 and seems to be rolling back up this summer. Obviously none of this stuff is set in stone and absolutely accurate but it’s fairly clear that Woot is turning around. But what does this mean? Woot is obviously cyclical and is a direct pointer to the pocket change of a certain technical class who may be interested in lasers and walkie-talkies from China that didn’t sell. That said, one would assume said walkie-talkies would be more desirable when you’re in a job than when you’re out of one and/or when you have a little disposable income. So to recap: Woot traffic took a dive in January and is slowly creeping up. This means it is more popular. As it is a shopping site I suspect the folks visiting aren’t like street urchins in some Victorian novel, their noses pressed up against the glass of a sweet shop dreaming of toffees and crumbles. They are actually shopping. In short, while I wouldn’t stake my dissertation on this trend, Woot’s ability to predict a financial rebound should not be dismissed and that trend is going up. Also they’re selling a Bluetooth headset with case right now for $30 clams. Not a bad price.